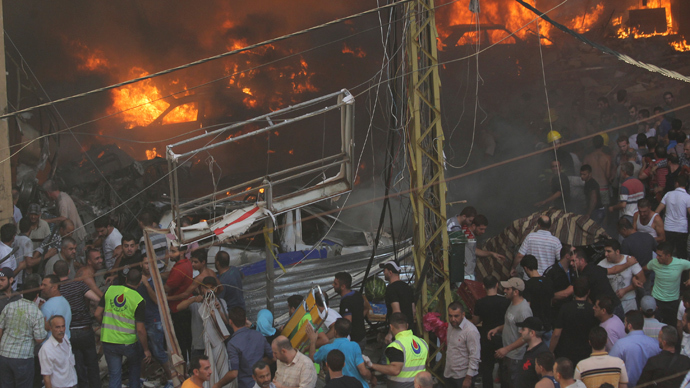 At least twenty people have been killed and 150 wounded in an explosion near the Hezbollah headquarters in Lebanese capital Beirut, according to security sources. Sunni radicals have claimed responsibility for the sectarian attack. "This is the second time that we decide the place of the battle and its timing...And you will see more, God willing," said a video statement from a group calling itself Brigades of Aisha, addressed to Hezbollah leader Hassan Nasrallah. Hezbollah represents a rival Shi'ite offshoot of Islam. A car bomb detonation near the same location last month wounded 53 people. The blast – reportedly from a car bomb – rang out outside “Mafhouz Stores”, an upmarket shopping mall in a predominantly Shi'ite district late afternoon on Thursday. A handful of buildings and dozens of nearby cars were damaged, as local TV cameras captured hundreds of bystanders trying to escape the smoke and fire in panic. An eyewitness reported that several people trapped in neighboring buildings screamed for help from the windows. Hezbollah militia immediately put up a security cordon around the affected area. Lebanon has been riven by conflict between its Shia and Sunni populations, which has intensified as a result of fighting in next-door Syria. Syrian president Bashar Assad is a part of a Shi’ite sect, while many of his opponents are Sunni. Hezbollah, which is also Shi’ite, has joined the war on Assad’s side, arousing anger among Lebanon’s Sunnis.